TANKS on the streets of Limerick. Workers on strike. A soviet is declared. The workers control prices and production. 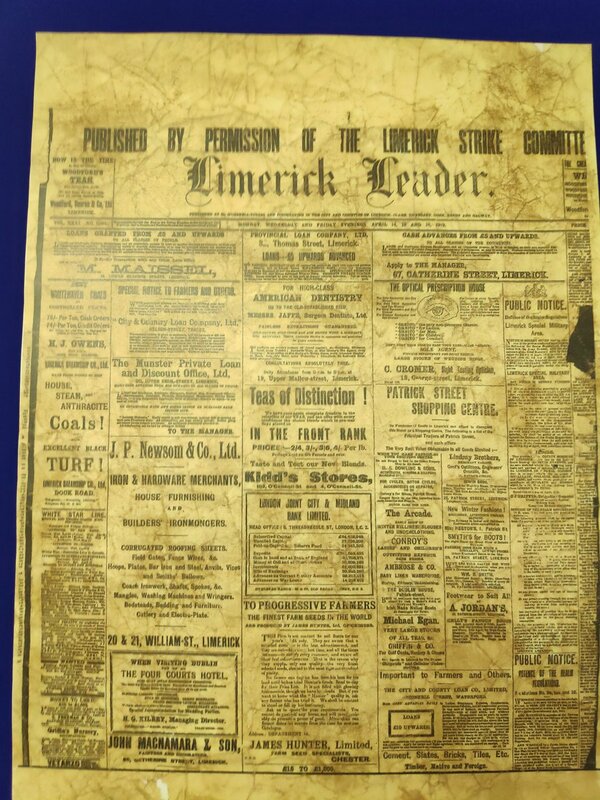 The Limerick Leader carries a notice that it was “Published by permission of the Limerick Strike Committee”. The workers even have their own police force and currency. It sounds like some fantasy. But this is actually our history. A history hidden from us by those who would prefer we forget that workers ran Limerick without the bosses, the clergy or the politicians telling them what to do. This battle was part of a momentous ‘Game of Thrones’ to decide who would rule Ireland: British Imperialism, Irish capitalism or the Working Class. There are no dragons in this captivating saga, but there are heroes and villains, tragedy and betrayal. In July 1917 Limerick got its first ever branch of the ITGWU, the radical trade union set up by Jim Larkin and James Connolly. The union grew rapidly to 3,000 members in the city, organising workers other unions had ignored: the lower paid, unskilled, precarious and women workers. There was a growing wave of revolutions right across Europe, from Russia to Germany, Italy to Scotland. In Limerick’s Markets Field, a 10,000 strong crowd passed a motion of solidarity with the Russian revolution on May Day 1918. Soon after Sean Dowling, a close friend and ally of Connolly, came to the Mid-West as an ITGWU organiser. Dowling was a Marxist, and was the organiser of the workers in the Cleeves factory, who were the first to call a strike in April 1919. The trigger for this was the decision of the British Military to impose martial law in Limerick following a massive funeral for IRA member Bobby Byrne. On April 13, Dowling attended a meeting of all the trade unions in Limerick where they agreed to follow the example of the Cleeves workers, and call a general strike. The general strike saw the whole city come to a standstill. Factories, pubs and shops were closed. The only things open on the first day was the printers making posters for the strike, and the trade union headquarters where the trade union leaders, now termed the ‘Limerick Soviet’ met. An indefinite general strike does more than just terrify the bosses and the state, it poses the question of power - who runs society? Clearly the bosses and the British military weren’t able to run things, they couldn’t even get a shop willing to sell them food. Instead, the workers began to run things themselves, through the ‘Soviet’ and special sub-committees they set up. A food sub-committee ordered grain in the docks to be unloaded, and the bakeries to make bread. Shops were reopened with prices and opening times set by the Soviet. This demonstrated a truth which we should remember today: Workers don’t need the bosses. They need us. In fact, workers can run society more efficiently and more humanely. In the Bruree Soviet a few years later, when the workers took over the factory and declared ‘We make bread, not profits’, they managed to cut prices, increase wages and increase production. A week into the strike, the Limerick workers had fought the British state and the Irish bosses to a stalemate. The army and the RIC didn’t dare leave their barracks. But they also refused to lift martial law. From day one, the hope had been that the trade unions nationally would organise solidarity action with Limerick to pile extra pressure on. The rail workers had indicated that they would come out on strike too, as had others. But that decision rested with the national leaders of the unions and the Labour Party. Far from being revolutionaries like Dowling, these leaders had a very different vision for the role of trade unions. They were people like William O’Brien who had been building a close relationship with the leaders of Sinn Fein, hoping to help them come to power and win a ‘seat at the table’ with them in a new republic. When they talked to the Sinn Fein leaders, they were quickly told to wrap up the Soviet. Sinn Fein didn’t like the British army, but they feared the working class in control even more. So, the national union leaders said they wouldn’t support escalating the dispute outside Limerick, taking the wind out of the sails of the Soviet. The Sinn Fein Mayor, Bishop and the Chamber of Commerce saw their opportunity and proposed a ‘compromise’. Workers were to go back to work immediately, and if they behaved themselves martial law would be withdrawn a week later. Cian Prendiville is a member of the Socialist Party and the Limerick Soviet Centenary Committee. He has just released a 5-part documentary podcast ‘Bottom Dog - The Story of the Limerick Soviet’, which is available on www.limericksoviet.ie and in all podcast apps. The podcast tells the story of the Limerick Soviet through interviews, re-enactments and dramatisation.